G. Blanchet and J.A. Rogers, “Printing techniques for plastic electronics,” Journal of Information Science and Technology, 47(4), 296-303 (2003). B.R. Acharya, S. Ramachandran, T. Krupenkine, C.C. Huang and J.A. Rogers, “Tunable optical fiber devices based on broadband long period gratings and pumped microfluidics,”Applied Physics Letters, 83(24), 4912-4914 (2003). F. Cattaneo, K. Baldwin, S. Yang, T. Krupenkine, S. Ramachandran and J.A. Rogers, “Digitally tunable microfluidic fiber devices,” Journal of Microelectromechanical Systems, 12(6), 907-912 (2003). J.W.P. Hsu, Y.-L. Loo, D.V. Lang and J.A. Rogers, “Nature of Electrical Contacts in a Metal-Molecule-Semiconductor System,” Journal of Vacuum Science and Technology, B 21(4), 1928-1935 (2003). B.R. Acharya, C. Madsen, L. Moller, K.W. Baldwin, R.A. MacHarrie, C.C. Huang, R. Pindak and J.A. Rogers, “In-Line Liquid Crystal Microcell Waveplates and Their Application for High-Speed Reset-Free, Polarization Mode Dispersion Compensation in 40 Gbit/s Systems,” Applied Optics, 42(27), 5407-5412 (2003). M. Lefenfeld, G. Blanchet and J.A. Rogers, “High performance contacts in plastic transistors and logic gates that use printed electrodes of DNNSA-PANI doped with single walled carbon nanotubes,” Advanced Materials, 15(14), 1188-1191 (2003). J. Zaumseil, M.A. Meitl, J.W.P. Hsu, B. Acharya, K.W. Baldwin, Y.-L. Loo and J.A. Rogers, “Three-dimensional and Multilayer Nanostructures Formed by Nanotransfer Printing,” Nano Letters, 3(9), 1223-1227 (2003). G. Maltezos, R. Nortrup, S. Jeon, J. Zaumseil and J.A. Rogers, “Tunable Organic Transistors that Use Microfluidic Source and Drain Electrodes,” Applied Physics Letters, 83(10), 2067-2069 (2003). J. Zaumseil, K. Baldwin and J.A. Rogers, “Electrical Characteristics of Organic Transistors Formed by Soft Contact Lamination,” Journal of Applied Physics, 93(10), 6117-6124 (2003). Y.-L. Loo, D.V. Lang, J.A. Rogers and J.W.P. Hsu, “Electrical Contacts to Molecular Layers by Nanotransfer Printing,” Nano Letters, 3(7), 913-917 (2003). K. Choi and J.A. Rogers, “A Photocurable Poly(dimethylsiloxane) Chemistry for Soft Lithography in the Nanometer Regime,” Journal of the American Chemical Society, 125(14), 4060-4061 (2003). J. Zaumseil, T. Someya, K. Baldwin, Z. Bao, Y.-L. Loo and J.A. Rogers, “Nanoscale Organic Transistors Formed by Soft Contact Lamination and Source/Drain Electrodes Supported by High Resolution Rubber Stamps,” Applied Physics Letters, 82(5), 793-795 (2003). M.V. Kunnavakkam, F.M. Houlihan, M. Schlax, J.A. Liddle, O. Nalamasu and J.A. 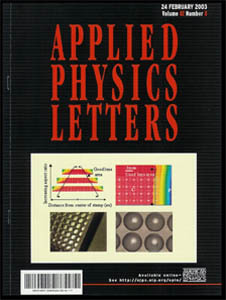 Rogers, “Low Cost, Low Loss Microlens Arrays Fabricated by Soft Lithography Replication Process,”Applied Physics Letters, 82(8), 1152-1154 ( 2003). B.R. Acharya, C. Madsen, L. Moller, K.W. Baldwin, R.A. MacHarrie, C.C. Huang, R. Pindak and J.A. Rogers, “In-Line Liquid Crystal Microcell Polarimeters With Applications in 40 Gb/s Systems,” Optics Letters, 28(13), 1096-1098 (2003). G. Blanchet, Y.-L. Loo, J.A. 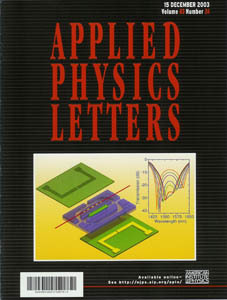 Rogers, F. Gao, and C. Fincher, “Large Area Dry Printing of Organic Transistors and Circuits,”Applied Physics Letters, 82(3) 463-465 (2003). J. Hsieh, P. Mach, F. Cattaneo, S. Yang, T. Krupenkine, K. Baldwin and J.A. Rogers, “Tunable Microfluidic Optical Fiber Devices Based on Molded Plastic Microchannels and Electrowetting Pumps,” IEEE Photonics Technology Letters, 15(1), 81-83 (2003).